The controversial social network Ask.fm has been bought by the owners of Tinder and Ask.com for an undisclosed fee. The site, where members answer questions posed by others, has been linked to teenage suicides in the UK and elsewhere and has been criticised for not doing enough to prevent cyberbullying. IAC, the US company behind the deal, said it would invest "millions" into improving safety on the site. Ask.fm's founders will leave the firm. The New York state attorney general, Eric Schneiderman, announced a safety agreement with the new owners. "Under the terms of the agreement, Ask.fm will revamp its safety policies and procedures," his office said in a statement. It said Ask.fm had committed to dealing with user complaints within 24 hours and removing users that have been the subject of multiple complaints. "An independent safety and security examiner will be appointed to examine the changes and report on compliance to the Attorney General's Office for three years," the statement added. The company was started in 2010 by two Latvian brothers, Ilja and Mark Terebin. It now boasts 180 million monthly users - almost two-thirds the size of rivals Twitter - with roughly 700 posts made each second. 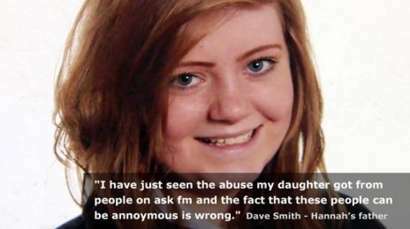 The site, which is very popular among young adults, came under fire last summer following the suicide of 14-year-old Hannah Smith, when it was claimed that abusive comments seen on Ask.fm had contributed to her death. Similar stories soon surfaced, and the Riga-based firm was heavily criticised for not adequately policing its site. It has also been denounced for hosting pages belonging to Islamic extremists fighting in Syria and Iraq, who had used Ask.fm as a recruiting tool. Ask.fm is set up by brothers Ilja and Mark Terebin as a rival to question and answer based social network Formspring. Privacy settings introduced to Ask.fm, including the option to disable anonymous questions. Ciara Pugsley, 15, is found dead in woodland near her home in County Leitrim, Ireland. This was the first of several teen suicides linked to abuse via ask fm. Hannah Smith, 14, is found hanged at her home in Lutterworth, Leicestershire. It is believed she killed herself after she was bullied on the site. 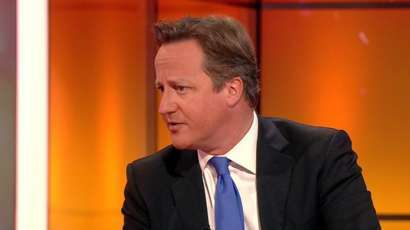 Prime Minister David Cameron urges people to boycott sites which do not 'step up to the plate' and tackle online abuse. He said that after the 'absolutely tragic' death of Hannah Smith, those running the websites had to 'clean up their act'. Changes made to make Ask.fm safer in the wake of online bullying cases. It said it would view all reports within 24 hours, make the report button more visible, and include bullying and harassment as a category for a report. 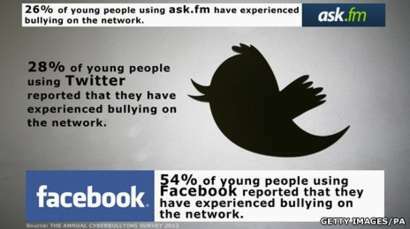 In the 2013 Annual Cyberbullying Survey by charity Ditch the Label, Ask.fm is named as one of the three most likely places teenagers experience cyberbullying, alongside Facebook and Twitter. Ask.fm launches a 'Safety Center' containing advice and guidance for users of the site and their parents. The network's new owners, IAC, say they are committed to improving child safety and will pour millions of dollars into hiring more moderators and installing better detection systems. "We wouldn't be getting involved if we didn't think we could make it safer," said Doug Leeds, chief executive of Ask.com, the IAC subsidiary behind the deal. Why would anyone want to buy a brand as toxic as Ask.fm? It's probably best known - among adults at least - as the social network that David Cameron wanted to see boycotted over cyberbullying. I understand that Ask.com first got interested in the site when it started legal action to protect its own brand from contamination. Then the US firm and its parent group saw just how big and engaged an audience the Latvia-based network had, and began to wonder about a different course of action. Now the new owners need to move quickly to prove they can to make Ask.fm a safe place for its young users without annoying them so much that they head elsewhere. What they have is the financial firepower which the buccaneering Latvian founders lacked - it's just that much easier to build and grow a web business in the United States than in Europe. Mr Leeds added that under new leadership, Ask.fm would pledge to deal with safety complaints within 24 hours. The site would do so by expanding the existing team of 60 staff, he said. IAC has also recruited Annie Mullins, a member of the UK government's task force on child protection on the internet, to help improve safety at Ask.fm, as well as Catherine Davis Teitelbaum, who previously worked on safety policy at Yahoo. Ask.com, known as Ask Jeeves in the UK, is owned by the New York firm InterActiveCorp, also known as IAC. In making the deal, Ask.com has joined forces with the venture capitalists (VCs) behind Ask.fm, who retain a minority stake in the firm. "Our intentions for the company aligned with the VC's," said Mr Leeds. "They had a laissez-faire, libertarian attitude," Mr Leeds added, emphasising that under the new regime, threats of violence and other distressing content would "not be welcome". Can Iraqi militants be kept off social media sites?